The days of summer will soon give way to the start of a new school year. For teachers, the end of summer can be met with mixed emotions. Even the most passionate educators can be reluctant to give up the freedom and flexibility of summer break. But it's also a great time to get excited about the possibilities that lay ahead. It's GO-TIME!!! As you gear up for back-to-school, here are seven reasons to be enthusiastic about the new school year. One of the most exciting things about the start of a new school year is the chance to meet new people and welcome them into your school. It's a privilege to get to know new staff members and students. And it's a great opportunity to share with them all the things that make your school great. It's also a great opportunity to find ways they can contribute to making your school even stronger. Remember that being new can be terrifying. Offer your support. Be sure to send the message loud and clear to everyone new to your school, "We're glad you're here." I also look forward to seeing everyone who is returning. Over the years, we build increasingly strong bonds with the people we work with. It's great to hear about their exciting adventures of summer and begin to share in the daily life of school again. I can't wait to see all the smiles and feel the energy as we come together again to help kids. Keep in mind that returning to school can be especially difficult in certain seasons of life. I am always reminded that a word of encouragement or act of kindness can go a long way to making the new school year better for someone going through a difficult time. For some students, summer hasn't been that great. They've had struggles, turmoil, maybe even hunger. Returning to school won't solve all their problems, but it will provide a chance for educators to make a difference. No matter what their summer was like, your students are counting on you now. They need to know how much you care. They need you to love them, listen to them, and to never give up on them. Your work as a teacher makes a difference in the lives of young people. That's a great reason to get excited about the start of the school year! It's great to enjoy the wonderful time away from school during summer break. Good teaching is demanding in so many ways. We need time to recharge. But there is something about doing what you are meant to do, even when it's hard. The start of the school year is a great time to reflect on why you started in the first place. Why did you become a teacher? How will you make a positive impact this year? When you have passion and purpose for your students and your teaching, you won't have too much trouble being excited for the new school year. When I reflect on a previous school year, there are always things I wish had gone differently. I see areas I need to improve, and things I want to change. The start of the school year is a brand new thing. It's a fresh start. There's something about the cyclical nature of school that lends itself to making adjustments based on last year to continue to make things better for learning. But the key is to reflect and set goals during the summer, so that you're ready to adjust and adapt this year. Positive people grow. Happy people grow. Healthy people grow. The new school year will not doubt present challenges that will help us grow if we choose to allow growth to happen. I believe growth is an essential part of being fulfilled in our lives. We can't stay the same or even have stagnant growth and expect to have a healthy and happy life. And for certain, we won't make much of an impact on others if we aren't willing to grow. I know some people dread the start of school because they feel that they are going to face challenges that are really difficult for them. Some struggle more with difficult students. Some struggle to keep up with paperwork or grading. Clearly, some struggle to get through the school day more than others. I think most of that is related to attitude. If we welcome the challenges and view them as a way to grow, it changes everything. If we invite hard things into our lives, it makes us stronger. Rarely do I see an unhappy teacher who also regularly takes on new challenges. Usually, the most unhappy people in your school are the ones who are most protective of their time and their comfort. So I think a GREAT reason to get excited about a new school year is that it's a GREAT opportunity to grow. What would your school be like if every educator had a growth mindset? I'm excited about the new school year because I believe this will be the best school year ever. I'm excited about the work our school is doing. I believe we are moving in a positive direction. I see a tipping point happening, where we will see learners empowered in ways we've envisioned. 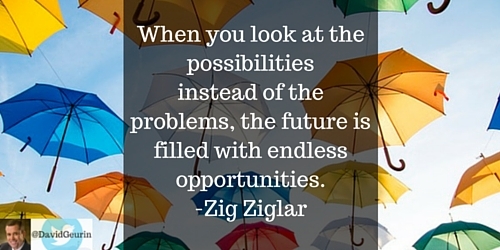 Your classroom has amazing possibilities too. Students will learn more about who they are. They will learn and grow and become more confident and independent learners. Commit yourself to the idea that great things are going to happen this year. Focus on the positive. Who knows what incredible things will happen this year in the life of your school? Questions: What gets you excited about a new school year? What are you anticipating? I would love to hear from you. Leave me a message below or respond on Twitter or Facebook. Here we grow!